The injury-time defeat at Dens Park on February 12, 2011 was one of the games that would cost Raith Rovers the First Division title that season. Future Raith manager Barry Smith was in the Dundee dug-out, while a Sky Sports pundit came out out of retirement to score the winner and condemn John McGlynn's Raith side to their first away defeat of the campaign. IT WAS almost as if it was written in the stars as Neil McCann ditched his microphone to don the boots and grab a sensational winner for Dundee four minutes into stoppage time and end Raith's record as the only team unbeaten away from home in Britain. A terrific Gary Harkins free-kick six minutes from time levelled matters for Dundee after they had gone behind to a first-half Grant Murray header, before McCann lobbed Raith goalkeeper Andy McNeil from 12 yards to send to Dens Park fans wild. Afterwards McCann said: "I'm not even getting paid by Dundee, my work at Sky is my new job and I just wanted to help out my old club. "The feeling when that ball went in to get the three points was quite special. "I never thought I would get the chance to run out again at Dens and it was so special. I felt like a youngster again." Dundee began the day, despite their 25-point deduction, just two points behind Ross County in eighth place thanks to an unbeaten league run of 14 games. Meanwhile, Raith arrived at Dens Park boasting the last unbeaten away record in Britain after Manchester United's defeat at Wolves last Saturday. Tensions were running high in both camps and it was clearly a contest of the immovable object against the irresistible force. Indeed, but for the deduction the protagonists would have begun level on points, so both combatants were eager to prove their worth. 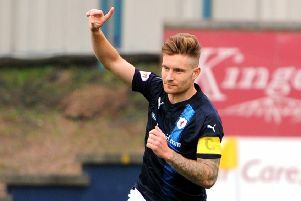 Dundee almost grabbed the early bragging rights with just ten minutes gone when captain Harkins slipped the ball through to Stephen O'Donnell, who slid in and got his effort on goal, but Raith goalkeeper Andy McNeil managed to race from goal get down to block. The league leaders finally got what looked to be the winner in 51 minutes when Allan Walker's corner from the left picked out Murray and his far-post header soared high into the net. That was the cue for McCann, at the age of 36, to come out of retirement and play for Dundee, 19 years after making his debut for the Dens Park club, his last senior outing being for Falkirk in the 2009 Scottish Cup final against Rangers. The former Scotland star came off the bench in 58 minutes to replace the ineffective Jonathon Stewart, but it was skipper Harkins, with a curling 20-yard free-kick who was to get the first plaudits before McCann's dramatic winner. After the match, Dundee boss Barry Smith said: "It gave the supporters something to cheer about. "We're asking the same players week in and week out to perform and I can't ask any more of them. "Neil won't want to take credit, but it's a great three points." Raith boss John McGlynn said: "I felt on the break we were dangerous and comfortable in the second half but we didn't clear things and a lot of things were our own doing. "And we ended up getting punished. We were in a position to get three points, then a point and ended up with nothing." The Raith team that day was: McNeil, Wilson, Murray, Ellis, Dyer, Davidson, Walker, Simmons, McBride (Williamson 78), Baird (Weir 69), Tade. Not used: Ferry, Wales, McGurn.